Life-Span Developmental Psychology: Historical and Generational Effects provides theoretical and methodological frameworks and examples in history-graded influences on life-span development. The book is a compilation of select research papers by sociologists and psychologists in the study of the biological and environmental determinants of development. 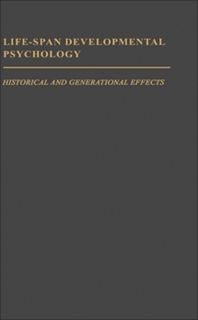 The topics discussed in the text include the historical and cohort effects; the aims, methods, and problems of research on historical constancy and change; the relationships between history-graded events and normative age-graded (ontogenetic) events; and the investigation of the developing individual in a changing world. Empirical samples of history-graded influence studies of various age cohorts from the United States and other countries are presented as well. Psychologists and sociologists will find the book very insightful. How Do We Measure Historical Time?